Who Benefits From PTA? Everyone! 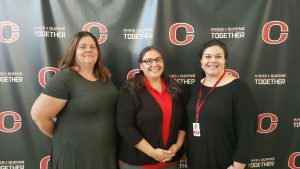 The Clinton Middle School PTSA is a team of parents, students, and staff who provide educational resources and support Clinton Middle School. We encourage and welcome parent/guardian volunteers to help in the Learning Resource Center, in the classroom, or to listen to children read. You can be a source of special skills, personal attention, and an extra pair of hands if you become a school volunteer. The days and the hours are up to you. If you can share some time with us, please give us a call. We know lots of moms and dads work during the day, but we want you to feel welcome to help whenever you can, however brief your visit with us may be. If you can’t be here, perhaps you can ask grandma, grandpa, a friend or neighbor to volunteer. More volunteers mean more people to help your kids, and that makes a better school. Check out the minutes from our most recent PTSA meeting. Lots of information pertinent to the education of your student!